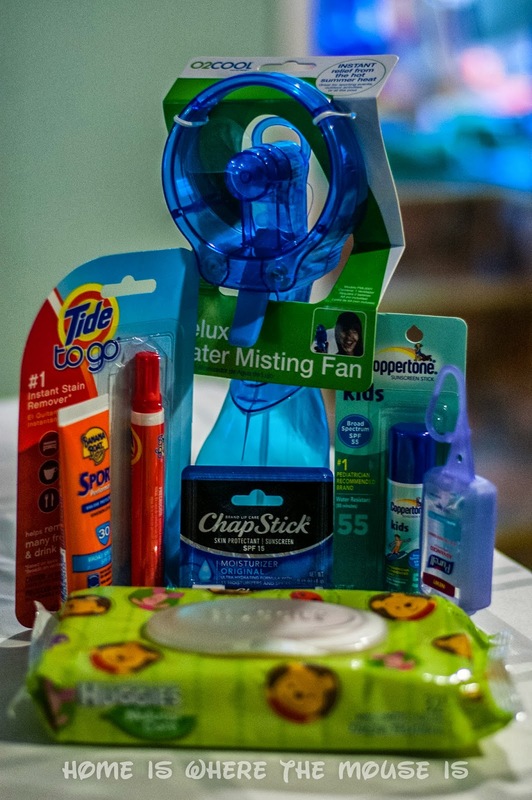 Home » Giveaways & Contests » “What’s in Your Park Bag?” Giveaway! “What’s in Your Park Bag?” Giveaway! This Giveaway has Ended! 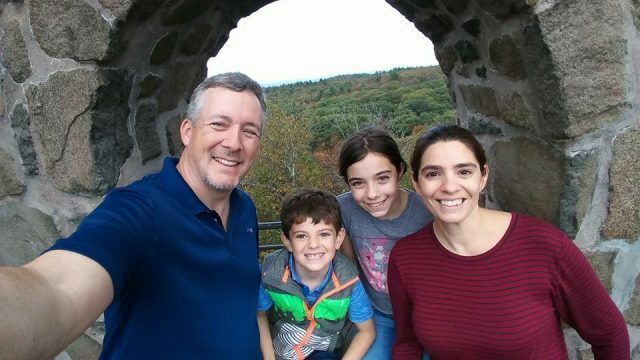 Congratulations to Amanda for Winning! Enjoy your prize! What’s in Your Park Bag? 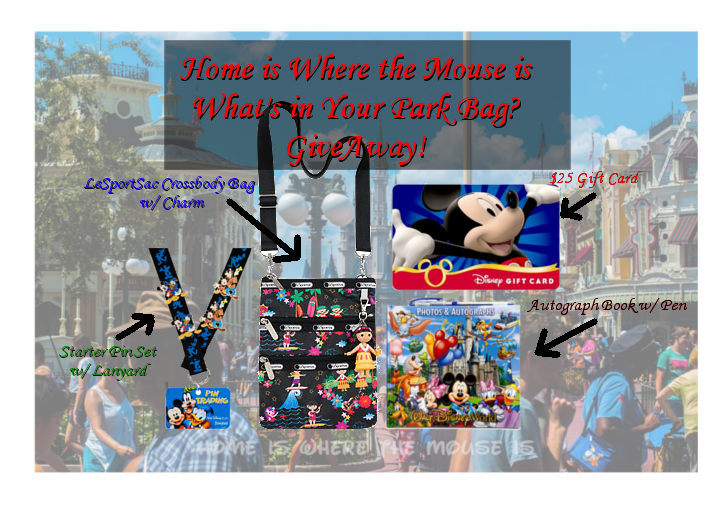 Let us know and enter to win our Fabulous Disney Park Bag Gift Pack! Win a Disney Parks Bag Gift Pack from Us! Simply tell us what you must have in your park bag in the comments below! A LeSportSac Crossbody “Kasey” bag with charm from the “It’s a Small World” collection. Measures 7.75 in x 9.5 in. (19.685cm x 24.13cm). It has zipped Main closures, Two exterior front pockets with zipped closures. Adjustable, detachable shoulder strap. includes detachable charm. This deluxe book is perfect for any Princess or Cowboy looking to take the magic home. Woody, Cinderella, and Mickey can write messages to your little one, sending them home with that special Disney magic forever. Comes with a pen! Use the Rafflecopter Widget below to enter. Earn more entries for Liking us on Facebook, and Following us on Twitter and Pinterest. Earn even more entries for sharing the giveaway with your friends on Facebook and Twitter. Winner will be notified within 24 hours. If for some reason the winner is deemed ineligible or is unable to claim their prize, a new winner will be chosen!Good Luck Everyone! Baby wipes, hand sanitizer, sunglasses for the kids, snacks (goldfish, lollipops, cheeze-its) a bottle of water or two, a small first aid kit (learned to keep that the hard way when I had to carry a bleeding child all the way through the park to the front where the first aid station was!). Autograph books/pens. Camera. Tissues. ponchos for member of our party, a towel, mints, first aid kit, hand sanitizer & lip balm. Cell phone with charger, wallet with Disney Dollars 🙂 and water. Hand Sanitizer, lip balm, camera, autograph book, pen, water, my park planner, Tylenol, & sun screen. anti-bac hand sanitizer – that's all I need and I'm good to go! autograph book,camera, hand sanitizer, and gift card! I always carry a messenger bag. In my bag I put my cash, Disney gift cards, credit cards, etc. in a clear plastic coupon holder. It is easy to find in my bag and is water proof. I never go to the parks without Purell, mole skin (for blisters), Disney lip balm, Advil, and an extra memory card for my camera. Park Tickets, room key, money, medication, cell phone and my camera! Hand sanitizer, Camera, batteries, cash & credit cards, dry bags, change of clothes, phone, pen, sunglasses, tissue, autograph book, reusable water bottle, water mist fan, umbrellas, ponchos, extra memory card and small towel. Debit card, room key, hand sanitizer, phone, and camera! Baby wipes, sanitizer, sunscreen, money, ziploc baggies, autograph books, park maps, band aides, aleve, tissues. The question should be what's not in my park bag because I carry so much with me! Park tickets, cell phone, wallet, sunscreen, chapstick, tissues, hand wipes, stain remover, ziploc bags, pens, first aid kit. camera, tissues, phone and hand sanitizer! My bag has my phone, camera, autograph book, pennies, sanitizer, chap stick, sunscreen, maps, wipes, credit cards, flashlight, pen, small towel, ID, cash and meds! Last time I was there I had water, wallet, phone, gum, lip balm, medicines, camera and my very stuffable sun hat. There may have been Luna bar or two. My camera, credit card, sunglasses, sanitizer, tylenol and ziploc bags. Camera, sunscreen, wallet and batteries. Hand sanitizer, diapers, wipes, ponchos, snacks, wallet, ziploc bags, phone and camera. ANd I am sure a lot more as our week progresses! water, sunglasses, sunscreen, wipes, snacks, band aids, napkins, cell phone, wallet, ponchos, camera, chap stick, fan, blanket, hair bands, medicine,glass case, autograph book,pen,and more, WOW I do need another Park Bag! Thank you for doing giveaways for all of us Disney Fans, you are Awesome, keep up the good work, I love reading your posts and getting information for your site. Camera, phone, money, chapstick, autograph books & pen, water bottle, and umbrella. Thanks for doing this giveaway! Wallet, Brita water bottle, autograph book, pen, Nintendo 3DS(to meet people and get walking points), chap stick, tissues, cell phone, scrunchie, ect. This list just goes on and on! wallet, cell phone, sunscreen, autograph books, pens, kleenex, hand wipes, sunglasses, chapstick, tylenol, gum, and much more! Camera, extra batteries, rain poncho, first aid kit, sunscreen…the list goes on and on!! Money, room key, credit card, gift cards, chapstick, sunscreen, tissues, few snacks, autograph book/sharpie, wipes, epi pen, phone! Camera, hand sanitizer, annual passes, and hook a baseball cap to the camera bag so I don't forget it. camera, wallet, phone, the kids stuff and mouse ears! Camera, phone, money, lipstick, a treat from the Guerlain boutique at the France pavilion (Epcot) and some GF cookies! Hand sanitizer, map, and lipstick! sunglasses, camera, phone, autograph item (pillowcase, book, or whatever else we make) with sharpies, Sorcerer cards, pins, pins, and more pins to trade! travel size sunscreen, hand sanitizer, wipes, lip balm, ziplock bags of different sizes for random things like (cell phones or cameras in case of rain, left over snacks etc), tissues, band-aids, rain ponchos, tiny bottle of bubbles to entertain kids in line. Sunscreen, ziploc bags to protect things from rain/water rides, camera, tissues, bandaids, $20, Key to the World Card, sunglasses, one bottle of water to start the day. I usually have an over-stuffed bag… but the absolute essentials are lip balm, bandaids or moleskin, phone, sunscreen, & water! We take all kinds of things, but the basics are phone, camera, sunscreen, chapstick, moleskin, water bottle, hand sanitizer, pin lanyards, and some small snacks. Camera, Camera battery, cell phone, wallet, tissue, pen, autograph book, water mist fan, raincoat, sunglass, umbrella. definitely sunscreen, the camera, water bottles,sweater and some snacks. Must-haves for the bag: Sunscreen, water bottle, hand sanitizer, camera, iphone, pocket ponchos, sunglasses, wet wipes. Camera, Water Bottle, Fruit Snacks (Toy Story preferably! ), Buzz Lightyear Jacket, sunglasses, and CASH MONEY! cell phone, credit card, room key, a little cash, pen, autograph book, zip lock bag with a few zip lock bags, napkins, hat, gum, maps, camera, rain poncho, tub of pennies and quarters, and anything i pick up in the day! In my park bag there is a bottle of water, cellphone, makeup bag, and tiny bottle of hand sanitizer. Room key, waterproof mascara and eyeliner, phone, camera, rain poncho, pen, a little money, hand sanitizer, bandaids, Neosporin, small mirror, inhaler. hand sanitizer/wipes, snacks, water bottles, extra batteries, camera, rain poncho, cash, small first aid kit, autograph books, penny/quarter container, photopass plus card, sunblock, glow sticks. hand sanitizer, camera, ID, debit card, SPF 15 lip balm, chapstick, money, poncho, bandaids. Sunscreen, hand sanitizer, baby wipes and pull-ups, camera, phone, wallet. Water bottle, camera, KTTW card, sunscreen, daily navigator & autograph book! Thanks! Ponchos, Glow sticks, passes, autograph book, camera, phone. Haven't been in a few years. Love some of these ideas for the next time I go! Water, phone, phone charger, cash and hard candies. small first aid kit (includes band aids, wipes, etc), extra hair tie for myself, ponchos, pretty much almost what everyone has said. If I am carrying the diaper bag, everything for the kids. If it is just me and the hubs, a ziplock, phone, money, tickets, and a few bandaids. We travel light! Just the minimum that we need… don't want to carry a ton! brush, hand sanitizer, camera, chapstick, phone, and money! camera and charger, phone, mole skin and scissors, zip loc baggies, water bottle, pain killers, money, park passes, maps,sunscreen, sweatshirt for the chilly indoor shows… good thing we still use a stroller! Can't forget pins and vinylmations for trading! Looks like my mobile post from last night didn't work! Thanks for the fantastic blog and fun giveaway! My park bag is like Mary Poppins's carpet bag, it has everything in it! The funniest item is probably dry socks, I hate getting my feet wet on the water rides and walking around all squishy footed! My bag..hmm tickets, camera, sunscreen, hand sanitizer lotion, baby wipes,stain stick,wallet with some money, autograph book and a fat pen. I leave extra socks, shoes and shorts in a daypack at the park entrance just in case.